For alma mater still there'll be a place in every heart. In memory we still shall be at the dear old U-V-A. Every med school student probably goes through this at some point, but last night, for the first time, I wondered to myself: what in the world am I doing in medical school!? If Reading Rainbow taught me anything, it was that "I can be anything." Why, then, did I decide to be a doctor? 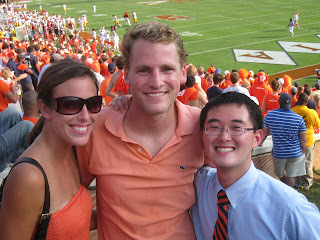 Why did the admissions office let me in to UVA? And, most importantly, why is biochemistry completely and utterly incomprehensible? On a happier note, I have found my niche at the Health Sciences Library. It's in a doorless side room on the ground level, where I can see everyone studying the lower floor. Plus, there's a window, so I can also see everyone who is walking in and out of the building. Basically, I am the guardian of the library, and I make sure that nobody leaves this inferno. Ever. DUN DUN DUN! It finally happened. I guess this day was always going to come, but I just didn't expect it to be so soon. I tried to save someone's number on my cell phone today, and when I selected "Add New Contact," I was cruelly informed that the contact memory was full. What kind of savage world do we live in!? I just upgraded to this phone, and I purposely chose the flip phone with the largest contacts storage capability (500 numbers). Apparently that was not enough. I guess I need to just go through and delete contacts, but it's so hard for me to do. It's basically saying to that person, "I will never call you again in my life. You and your phone number are dead to me." I'm just not ready to condemn anybody to that fate... except for you. I know I've always been a little scatterbrained, but my forgetfulness has reached epic proportions since I graduated from college. It's rather frightening how many things I've misplaced over the past few months. Just this week, I have managed to lose my ID badge (which turned up in the pocket of my white coat), my Littlejohn's gift certificate (which I left at the bowling alley), my wallet (which reappeared in my 8000 lb stack of books), my water bottle (which Kaelyn found outside our classroom), and my dignity (I bade it farewell at the Fauxfields party, and I'm pretty sure I'll never get it back). On the bright side, I passed my first anatomy quiz! I'll be a doctor yet (maybe)! Henrietta is a truly convincing argument for healthy diet and exercise. We dissected our cadaver's back today, and let me tell you, Henrietta is F-A-T! The term "love handles" does not even begin to do her justice; she literally had four inches of fat under her skin around her midsection. She's a sneaky one, too; each time we had to reflect another layer of muscle, SURPRISE! there would be another layer of fat for us to remove. Oh, Henrietta. You and your silly games. You get me every time! In other news, the Olympics are finally over, and I officially don't know what to watch on TV anymore. I actually sat through an entire episode of 30-Minute Meals with Rachael Ray without changing the channel. Please shoot me before I let myself watch something worse, like 7th Heaven or Army Wives. I'm taking a break from studying Anatomy all day to blog. This, of course, is a direct result of the horrific tubing experience we had yesterday. It's not that I didn't have fun, it's just that I didn't expect to be on the water from 10am until 4:45pm. The low water level combined with the non-existent current made it perhaps the longest experience of my life. I felt like I had aged 20 years by the time we got out of the water, a belief that was confirmed when I woke up this morning with lower back pain, undoubtedly caused by the beating I took from the vengeful river rocks. Anyway, I sang at Convocation with the University Singers this evening, and it made me pretty nostalgic. President Casteen gave the exact same speech he gives every year (with updated statistics), someone came up to read a letter from the Seven Society, and first years continued to wonder why their RAs were making them go to some sort of an event called "Convocation." They did have Cavman riding down the Lawn on a horse, which I don't remember seeing before, and it was pretty cool. *Just kidding. I went straight home after rehearsal and was in bed by 11pm like the old man I have become. Okay, this lady must be crazy. Underwear is either new or it's used; "like new" is not an option. If she's not returning it to the store, then the underwear is probably no longer in its original packaging, so how do other Freecyclers know that they haven't been worn? I see you over there, nodding your head in agreement. Yes, even you, sandridge5. My name is Sam. Oh, you say we've met before? That's funny, I honestly don't remember seeing you around. Thanks, it IS my birthday... yes, I DID just turn 22... wait, how do you know so much about me? You say I screamed it to you last night at the bar? No, not in the bar, you were on your way home, and I stopped you to tell you that it was my birthday. Okay, I can deal with that. What's that again? I literally attacked your friend who was walking with you? Why would I do that? Oh, because he wouldn't say "happy birthday" to me when I asked him to. I see. Yeah, I tend to get a little out of control at times. Oh, that was actually a year ago today, and you still remember it. Wow, you have a really good memory. Yep, that was me. Well, I wouldn't say "banging" as much as simply "knocking" on the doors of the Virginian. It was my birthday; I deserved to be let back in, right? Okay fine, I did throw my whole body at it once or twice. You're telling me that last night wasn't much better? I don't like your tone of voice. Hey, don't judge me, alright? You're really blunt for someone whom I've only "met" twice. Okay, I'm leaving; this conversation is over. Geez, some people around here just have no courtesy. Whatever. See you next August 21st. We shaved and washed our cadavers today, which is something I can honestly say I never want to do again. Talk about awkward! Luckily for me, Henrietta (as we decided to name her) was a very well-groomed old lady. I can tell we're going to have a lot of fun together, even though she takes FOREVER to make her next chess move. Come on, Henrietta! This isn't the World Chess Championship, and we all know you're no Bobby Fischer! *Just kidding. A false positive to scare her a little will do. If I had to describe transfiguration professor Minerva McGonagall, I would probably say that she is a stern professor whom the students respect, because they know that underneath her fierce demeanor lies a teacher who truly cares about her pupils. Coincidentally, this is also how I would describe my anatomy professor Melanie McCollum. Her lecture this afternoon was very straightforward and succinct. There were several opportunities for us to answer questions, and whenever someone gave a wrong answer, which was more often than not, she would simply say, "No," and call on the next person. Also, she disguised herself as a tabby cat perched atop the front desk when we first walked into class. *Joke courtesy of Catherine Nicholas. 1. I know nothing about the wilderness. I have gone camping twice in my life, and both times I had an Eagle Scout with me. 2. I know nothing about medicine. The last time I got a tetanus shot, I passed out. True story. 3. I know nothing about society. GROP LIKE MAKE FIRE! 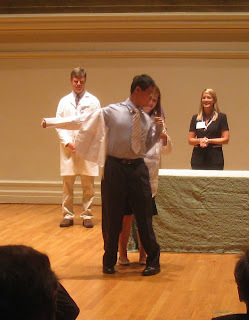 We had our white coat ceremony today, and who woulda thunk it, we took the Oath of Hippocrates! To be honest, I kind of didn't even realize that it actually existed. It was always one of those mythical things of legend to me, with the original manuscript lost centuries ago when the Romans invaded Athens in 88BC. Apparently not. Of course, right after I swore to "Do No Harm," I killed a bug inside my car that was crawling around on the window. I tried to lower the window to let it out, but instead, the bug got sucked down into the door with the window. I could hear it frantically flapping around in the door, but the buzzing soon subsided, leaving me feeling like the worst human in the world. POM Group 24, the crème de la crème of the UVA School of Medicine Class of 2012. 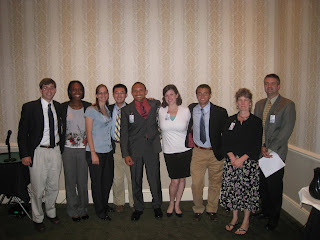 Of course, every other group decided to get their picture taken at Convocation after they saw us do it. What can I say? We're trendsetters. The lunch lady yelled at me today for asking if the leftover boxes were extras. "This isn't for you; you get what you got already," she snapped. Horrified and demoralized, I could do nothing but walk away with my head down, my tail between my legs, and my stomach still hungry. In retrospect, I probably should have just said, "It's fine... trust me, I'm a doctor." I remember the day I moved into college. I remember meeting my roommate for the first time, having my first suite meeting with my RA Jimmy, going to the AFC Block Party to get my orange t-shirt, and then walking for twenty minutes to the "real" block party on Wertland that ended up with more cop cars than first years. Well, today was not like that at all. I officially registered for the University of Virginia School of Medicine today, which apparently involves filling out several forms and surveys against no identity check. Hello, rest of my life; goodbye, soul.